Asking for a promotion, negotiating for a raise, or speaking up about concerns may help a male employee get ahead, but a female employee could easily end up labeled as “bossy” or worse for the exact same behavior. Research suggests that many women rightly worry that being “too aggressive” may result in backlash from their colleagues and supervisors. 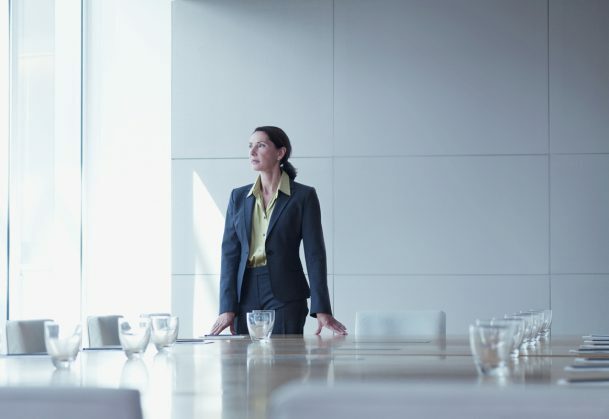 This double-standard may help explain why women across the globe still struggle to gain leadership positions and pay parity with their male peers. “Management and supervisory positions are overwhelmingly held by men. Within each sector men are more often promoted than women, and paid better as a consequence. This trend culminates at the very top, where amongst CEOs less than 4% are women,” according to the European Union’s Commission on Justice. A large body of research suggests that people tend to penalize others for violating behavioral norms. Beliefs about appropriate roles for men and women often encourage men to be strong and assertive, and women to be warm and nurturing. Both men and women risk being socially penalized for violating these prescribed gender roles. However, a new meta-analysis suggests that there are ways for women to avoid some of this workplace backlash. Study authors Melissa Williams (Emory University) and Larissa Tiedens (Stanford University) designed a meta-analysis of 71 studies examining gender, dominance, and backlash. Consistent with previous research, they found that, compared to men, women were much more likely to be punished for showing dominance behaviors. That is, assertive behaviors like asking for a raise or talking during a meeting can carry substantial professional risk for women. They also found that although dominant men tend to get a professional boost, women often pay a price in “likability.” Being dominant did not hurt perceptions of women’s competence, but it did make people like them less. Importantly, Williams and Tiedens found that likability can be an even more important factor than competence for getting hired. “Male leaders are able to express dominance—without incurring liking penalties—in ways that female leaders are not. Past research has established, for instance, that employees must be seen as likable as well as skilled to be hired or promoted— competence alone is insufficient,” Williams and Tiedens explain in the journal Psychological Bulletin. But the researchers found that not all forms of dominance led to backlash. Interestingly, the results suggested that implicit forms of dominance, such as body language or facial expressions, did not harm women’s status. “There appears to be no need, for instance, for leaders to shy away from taking a commanding presence in a meeting, such as by standing tall and using a loud voice,” Williams and Tiedens write. The researchers admit that this is not a solution to the systemic problem of gender bias. However, Williams and Tiedens hope that these results will provide women with tactics – such as using dominant body language – that can help them achieve professional goals without incurring social costs. Is the hope from the researchers really to help women find tactics in a male dominated environment trying to become more likable despite also being dominant? An alternative hope would be to help broaden these narrow stereotypes all together. Hi Sophie. Excuse, you meant fighting the stereotypes instead of adapting to them, i get? I agree, as this is not acceptable as a way to view women, men and gender roles in general, as if we got stuck in the 50’s!